More than a year after appropriating 98.5 acres—and 9 months after demolitions began—the State of New York finally unveiled two scale models embodying plans for a futuristic office complex in a revitalized Albany. 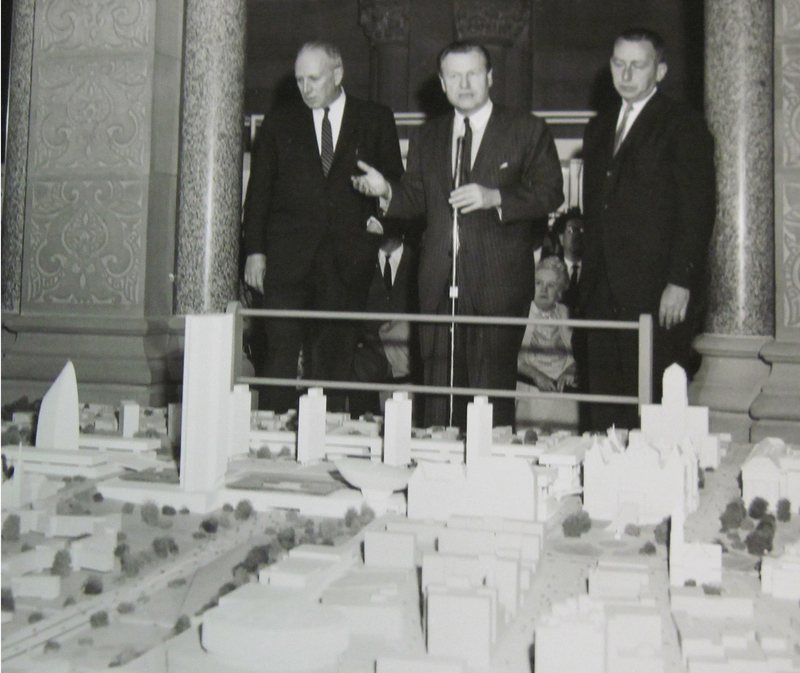 Taking center stage at the April 23, 1963 ceremony in the Capitol Rotunda, Governor Nelson Rockefeller declared that the State’s plan would transform Albany into “the most beautiful and efficient capital city . . . anywhere in the world.” Albany Mayor Erastus Corning, standing beside the Governor, held his tongue but seemed unable to control the sour look on his face. 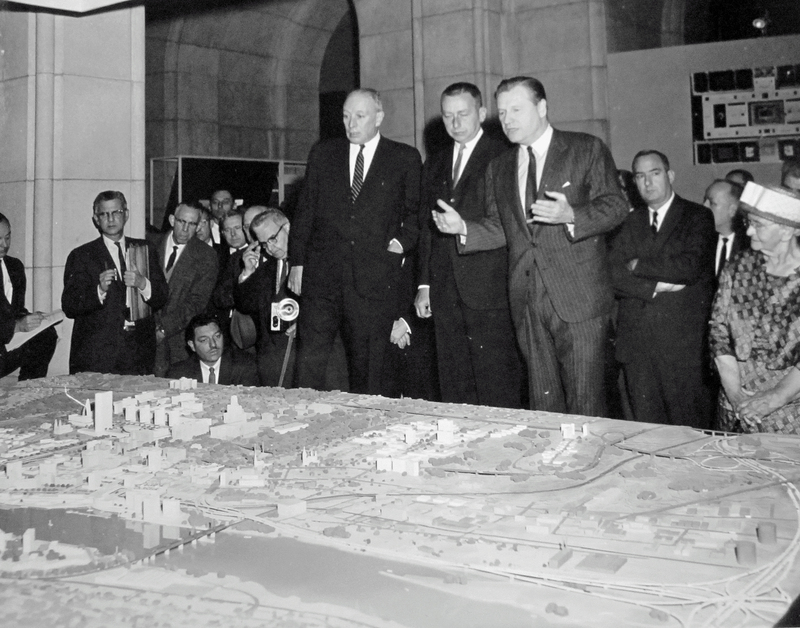 Nelson Rockefeller (right) explains the State’s plan to “rehabilitate” Albany. On the platform with him are Malcolm Wilson and Erastus Corning. This model is now in the collection of the NYS Museum. NYS Archives. Although infuriated by this meddling in Albany, the Mayor would assist with construction of what he referred to as Rockefeller’s “Brasilia” by helping the State acquire funds. However, that was the extent of Corning’s interest. He refused to collaborate on other aspects of the plan—including creation of a historic park along the Hudson (complete with reproduction Half Moon) and construction of a convention center. The whereabouts of this model by Wallace K. Harrison Associates is as yet unknown. NYS Archives. One of the two models unveiled by the Governor is now owned by the New York State Museum. It reveals the broad scope of the State’s plan to transform Albany and was recently on display as part of the museum’s “Rockefeller at 100” exhibit. The location of the second model, prepared by the architectural firm of Wallace K. Harrison & Associates and focusing on the South Mall area, is as yet unknown to us. This lost model is likely the same one that biographer Richard Norton Smith described Rockefeller playing with “like a kid on Christmas morning.” Please let us know if you have a lead. Video of the unveiling ceremony, March 23, 1963. NYS Archives. Corning was well aware of the tacky look that Rockefeller was about to give gracious old Albany. It was not meddling, rather deep anger at what Rockefeller was going to do a city with very old Dutch origins. What Rockefeller did to downtown Albany is forever tacky and disgraceful. The Egg is ridiculous looking. The rest of the concrete and steel that Rockefeller put in are sterile. Rockefeller wasted huge amounts of money – money that should have come out of his own pockets to glorify his ego. I’ll forever be amused by the way the old smarmy devil died.